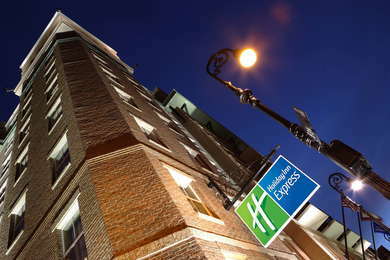 Since all buildings in the Historic District must conform to the local charm, Holiday Inn went all-out, creating a handsome interior design in the public spaces, with tasteful animal-print settees, leather club chairs, fireplaces, and classy chandeliers—so this hotel may change your perception of what is generally thought of as a modest, limited-service chain with no notable atmosphere. Guest rooms, especially the deluxe ones on the concierge level, are particularly impressive. Done in a taupe palette with textured walls, they have wet bars, contemporary designer bathrooms, flat-screen TVs, and microwaves. Along with luxury bedding, furnishings throughout the floors are tasteful with minimalist appeal. The rooftop swimming pool has a shady gazebo and fabulous river views. A bank of public computers is available to guests. The guest rooms and suites here, while not up to boutique hotel luxury standards, do give you the local charm and comfort for less. 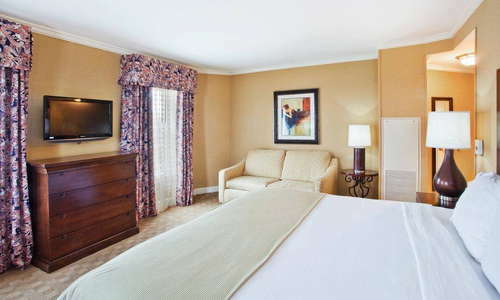 The rooms are kept up well, beds are comfortable, and the decor is tasteful contemporary. Corner suites all have lovely views and pleasant, well-planned layouts. Rooms with a Bay Street view have great vistas of Factor's Walk and the back of the historic riverfront, including the gilded dome of City Hall. There is ample sink space, and bathrooms are meticulously maintained and cleaned. Fixtures and design are modern with touches of the antique, lending that extra smidge of class. Not only will the decor make you feel invited, you may want to sit a spell and study your local map or discuss the day's plans. The soothing palette edged in rich, polished wood and brown leather evokes a grand English library theme. 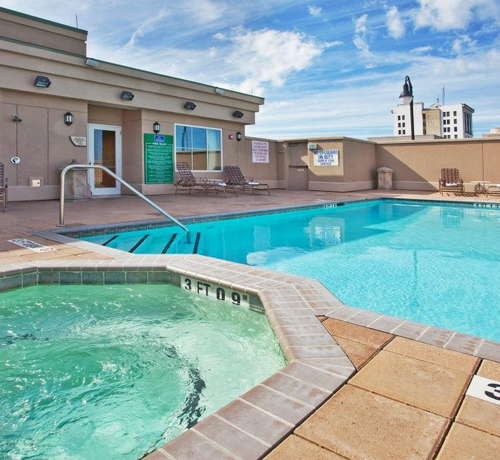 The rooftop pool is clean and inviting, and the hot tub is especially tempting in the evening. If too chilly to use the pool, or you forget a bathing suit, the rooftop pool gazebo is still a great place to gather for incredible river views. The gym is small, like most hotel gyms in the area, but kept in good working condition. The Meeting Room Restaurant and Bar serves southern classics for breakfast and dinner on the lobby level, as well as room service and meeting or event catering. Separate from the restaurant, the bar/lounge is intimate; it's great for unwinding in quiet after a day of socializing. Treylor Park (1-minute walk) on Bay Street is a hip eatery with trendy decor and offbeat menu items that are surprisingly addictive. Expect a wait for Sunday brunch and come early. The terrace of New Orleans-inspired Huey's on the River (4-minute walk) has an ideal river view. If you're grabbing brunch here before a lazy stroll along the river, the crabcake benedict with fried green tomatoes is a hearty and delicious choice. Beautifully designed in rustic splendor, Pacci (6-minute walk) takes traditional Italian cuisine to new heights with locally sourced Southern flair. Jen's & Friends (5-minute walk) is a cute hole in the wall that serves an astonishing number of specialty martinis. Top Deck Bar on the roof of the Cotton Sail Hotel (6-minute walk) does both fruity and serious cocktails well, and the view of the river is spectacular. Comfortable, unassuming, and staffed with genuinely helpful people, this Holiday Inn Express punches above its weight class—and price point—in hospitality.